I have no idea what to expect when you're expecting a baby, because I've never expected a baby, but I do have some expertise on what to expect when you're expecting to lose fat. When you are trying to lose weight I am here to tell you that it's not easy, no matter what those advertisements on the Internet may claim. It takes time, commitment and patience. It takes a lifestyle change, even if it is just one habit at a time. It's better to begin your journey with a little knowledge of what to expect in order to avoid frustration. When the excitement of a new program wears off, it's habit and consistency that take you the rest of the way to goal achievement. What to expect when you're expecting to lose weight, once and for all. Save to Pinterest for later. To lose weight slowly is the best goal for most people. With regular lifestyle changes, most people can expect to lose between a half a pound and two pounds per week on average, over time, when in a moderate calorie deficit. 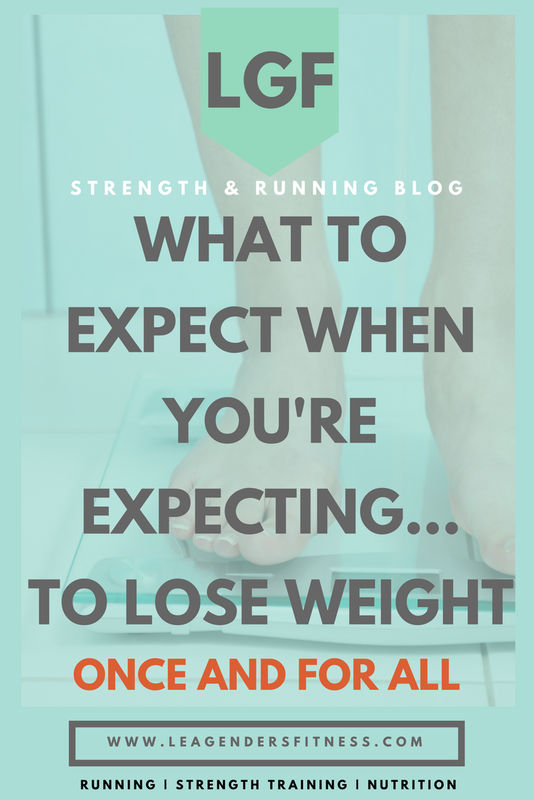 If you expect to lose weight more quickly you may be disappointed. Slow and steady wins the fat loss game. If you lose weight any faster it is more likely that you will gain it back. Our goal should be to lose weight and keep it off for life. In the end, it won't matter if it took you six months or up to two years to lose the weight if it is off for the rest of your life. You can't do what you've always done and this time expect to have different results. Have you been on diets before? (raises hand!) Were they effective? Spoiler alert: if you gained the weight back, your diet wasn't effective. Fat loss usually requires lifestyle changes and lifestyle changes start with healthy habits. When healthy habits are cultivated a healthy lifestyle emerges naturally. It takes time and effort but building healthy habits are the backbone of any good fat loss plan. Forget quick fixes, forget 90-day restrictive diets or extreme fitness plans. Learn to change your lifestyle for sustainable fat loss. Since our goal should always to lose fat, not weight, it is pertinent to your success and your sanity that you don't put too much stock in the number on the scale. The number will go down if you lose fat and that would be a good result. The number on the scale will go down if you lose water and that is a neutral result, neither good or bad. The number on the scale will go down if you lose muscle and that result would be detrimental your long-term success. It's critical to preserve muscle while you lose weight with adequate protein intake and resistance training. A lower number is not always a good result and a higher number is not always bad. Lose your attachment to the scale to maintain your sanity during this process. Take body measurements. Measure body fat percentage, pay attention to how your clothes fit, how well you sleep and how you feel. You can watch the scale to make sure it is generally moving in the right direction month after month, but the scale only tells a small part of the story. Open up your mind to new definitions of success. You will hit a plateau. Repeat after me. I will hit a plateau. This is normal and expected, so when it happens, try not to let it frustrate you. People give up altogether when they hit a plateau. This is unfortunate because it is totally normal and expected. Two pounds a week is often quoted as the healthy amount of weight to lose per week (heck, I quoted it above already). However, it is critical to realize that means that you will lose on average two pounds per week over time. Get it? There's no guarantee that you will lose two pounds a week, every week. In fact, throw that idea out the window. The body just simply doesn't work that way. Begin this journey will the full knowledge that fat loss isn't linear. You will not lose two pounds every single week no matter how hard you work or how strict your diet. The more important factor is that you are on a downward trend. Lose the attachment to the scale and focus on how you look, feel and perform instead. Fat loss is never linear. Never. When you decide that you want to lose fat your whole life suddenly doesn't change to accommodate. You still have kids who want to eat hamburgers and husbands who want to order pizza. Your boss will still order sandwiches and cookies for that working lunch and you probably will have to stay late next Friday (sorry to be the bearer of bad news). You'll probably oversleep your alarm and your kid will continue to forget about his big project due until the night before. Get it? Life isn't suddenly going to get easy because you decided to lose weight. The key to success is to develop healthy habits that work within your already crazy life. You might be able to run away to a fat loss retreat for 12 weeks, but the rest of us have lives. (And that wouldn't be effective for long-term results anyway because what happens when you return to normal life?) For long-term success, don't try to change your whole life around your fat loss efforts (that's not sustainable), instead learn to fit new healthy habits into your already busy life. Develop healthy habits, learn to make smarter choices, do the best you can with what you have, make movement a priority in your life. Fat loss is not about all-or-nothing. It is learning to enjoy the journey and working to change your lifestyle to match the results you desire. You WILL get there. You don't need overly restrive diets or extreme exercise programs. Those aren't sustainable and work against you in the long run. It's all about lifestyle and habit changes. Need help? I am taking on just three new clients in my nutrition habits coaching program. Why three? So I can offer the best service and personalized support to each of my clients. Learn to build healthy habits from the ground up to change your lifestyle once and for all. Do you think you know what you should be doing for fat loss, but aren't staying consistent? Then this may be the program for you. But it's definitely not for everyone. Take this quiz to see if you would be a good fit. THEN, to the three people who qualify, I am offering 75% off the first month so you can try it out for yourself to see if you like it. There is no long-term commitment, other than your personal commitment to give it your best effort. If it doesn't work out for you, then cancel anytime hassle-free. You have nothing to lose except that weight. Like this post? Do you know someone who might benefit from it? It helps me when you share with your friends and followers.